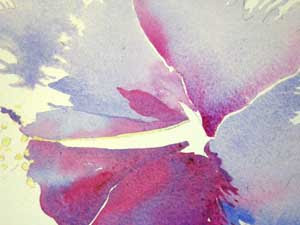 Here I have added a little wash of French Ultramarine Blue to enhance the shadow areas and give the flower some depth. Draw water from the white, dry area into the areas of deep pigment to create soft, clean edge transitions. Love the colors you are using and the way they blend and granulate and - well, that's what makes watercolor so much fun!